DRDO offers exciting and challenging career opportunities to work on defence systems, infrastructure & related activities in a broad spectrum of subjects/disciplines at its more than 60 laboratories/establishments spread throughout the country. Government job online applications are invited for the recruitment of Senior Technical Assistant ‘B’ (STA ‘B’) through DRDO Entry Test-2018 in various subjects/disciplines as per section-1 below. Candidates are advised to read the complete advertisement carefully related to this DRDO Recruitment 2018, before filling up the online application form for these DRDO Jobs 2018. Complete instructions for filling-up of online application and Frequently Asked Questions (FAQs) are available on CEPTAM notice board of DRDO website www.drdo.gov.in as well as we also share the complete detail below related to this DRDO recruitment for Technical Assistant 2018 below. This official advertisement related to DRDO vacancy consists of various sections, we try to share all valuable information over here in this article. All details given in these sections are applicable to each candidates who are wishing to apply this DRDO Vacancy. Read the who article carefully before moving to online application. What are the Various Eligibility Criteria for applying this DRDO Recruitment ? ESSENTIAL QUALIFICATION REQUIREMENT (EQR): Bachelor’s degree in science or Three years Diploma in engineering or technology or computer science, or allied subjects in the required discipline. Candidates must have acquired the EQR as on crucial date of eligibility for the posts they are applying. Those awaiting results of the final examination as on crucial date of eligibility for the prescribed qualification are not eligible and hence should not apply. B.Sc. applicants essential have read the mandatory subject for at least for two years during the course of B.Sc. programme. Please note that the candidates possessing higher qualification, viz., M.Sc. or B.Tech. or B.E. or Ph.D. degree etc., as on crucial date of eligibility, shall not be considered for the recruitment. Mere fulfilment of the minimum eligibility does not entitle any candidate to claim his/her candidature for selection to any post. Age Bond: Applicants age must be in between 18 years to 28 years for applying this DRDO Recruitment 2018. What is the application Fee for applying these Government Jobs in DRDO? 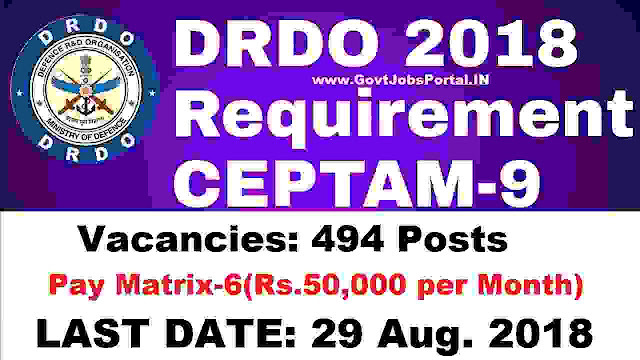 Candidates can apply for this DRDO Recruitment through online channel, that means only online application form are accepted by DRDO department. The process for applying online will be activated on 4th Aug. 2018. Candidates can apply online up to 29th Aug. 2018. You can visit to the official website of DRDO for online application. We also share the link below for online application form. (i) Candidates should read the instructions carefully before making any entry or selecting options. The detailed instructions for filling-up of online application are available on our website. (ii) Candidates should save and review his/her application before submission. (iii) Candidates are required to make online payment of application fee (wherever applicable). (iv) After the submission of application, request for change/correction in the particulars given in the application form, shall not be tickled under any circumstances. CEPTAM will not be answerable for any penalties arising out of non-acceptance of any correction/deletion in any particular given by candidates in application form. Hence candidates are advised to fill the application form carefully flor this DRDO Recruitment 2018. 29th Aug. 2018 is the Last Date to apply.